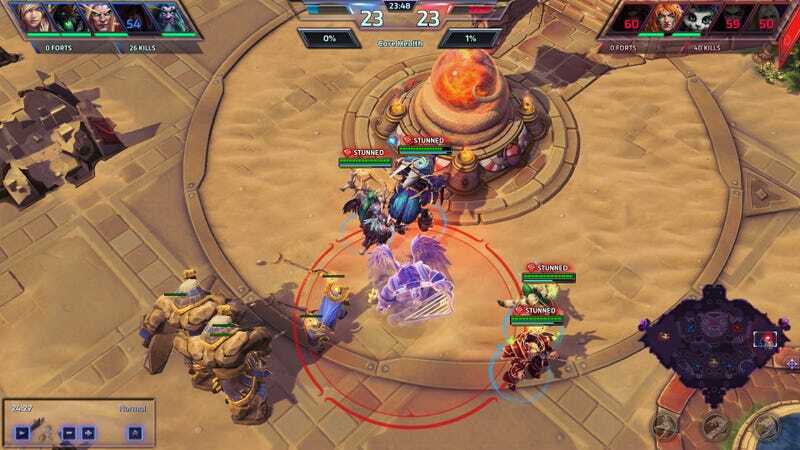 The angelic ghost cow near the bottom of this screenshot is Heroes of the Storm’s E.T.C. He’s in ghost form because of a passive ability he can unlock, which automatically triggers an area-wide stun move called “Mosh Pit” on death. I’m guessing the E.T.C. player here is crying tears of joy for selecting this trait. The screenshot, captured and shared by Reddit user Nakki2, quickly shot to the top of the Heroes of the Storm subreddit for a good reason: this is an absolutely ridiculous ending to a nail-bitingly close match. I mean, look at the health of the cores! The E.T.C. player’s core is at 1% health, while the enemy team is at 0%. This means the two teams were base-racing—trying to destroy each other’s core before the other one does. The only reason E.T.C.’s team won is because the other team killed the bovine warrior—thereby stunning themselves, and giving their opponents a precious millisecond or two to edge ahead by a single percentage point.